Christine Lagarde is planning to visit China, India and Brazil to drum up support for her bid to head the International Monetary Fund (IMF). The French finance minister said she wanted to visit the three countries in an effort to ease concerns over her candidacy. Emerging economies have voiced their concerns over the continuing hold of European nations over the IMF. All 10 of the fund's managing directors since its inception have been European. Leaders of developing economies have voiced their displeasure, saying that the head of a global body should be chosen purely on merit. India's prime minister Dr Manmohan Singh was quoted as saying: "We would like to remind the industrialised world that there is a tacit agreement that the top positions in international financial institutions must not go to specific countries as a matter of right," according to a transcript of comments issued by the Foreign Ministry. 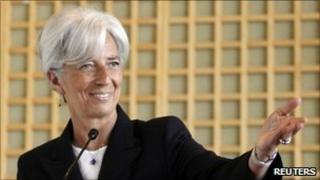 Lagarde is set to start her tour in Brazil on Monday, according to messages she posted on Twitter. On Sunday she posted a message announcing plans to fly to Brasilia where she will meet with fellow finance minister Guido Mantega and the head of Brazil's central bank, Alexandre Tombini. The balance of global financial power has changed drastically in the past few years. Economies like China and India have grown at a much faster pace that those in the developed world, making them increasingly important players on the world stage. However their influence at global bodies like the IMF has not altered much during the same period. And India's prime minister Dr Singh said it will take a long time for that change to happen. "You do recognise that those who exercise power, they don't want to give up power and therefore the struggle for a better, balanced world order, a more equitable world order, including the management of global institutions like the IMF, World Bank, Security Council… it is going to be a long haul, I am afraid," he said. His views were echoed by Professor Charles Adams of the Lee Kuan Yew School of Public Policy in Singapore, who said that though the IMF had been moving in the right direction, the pace had been too slow. "We have seen some changes in the IMF away from the European and major advanced economies to the emerging market economies, but it has been slow, at times painful," he said. "It does not yet reflect the economic reality," he added. The French foreign minister Alain Juppe said that Ms Lagarde had received the backing of the leaders of the Group of Eight Nations (G8) of developed economies. "Among the eight heads of state and government, plus the president of the European Commission and the president of the European Council who were there (at the G8 meeting in Deauville, France), there was unanimous support for Christine Lagarde," Mr Juppe was quoted as saying by the Reuters news agency. The Group of Eight Nations represents some of the biggest and most powerful economies in the world. Its members are the US, United Kingdom, France, Germany, Italy, Japan, Canada and Russia.